Tonight is Yuri's Night, and also the 25th anniversary of the first launch of the Space Shuttle, so permit me to wax a moment on space travel. The Detroit Free Press has an article called "Five Things About Space Travel" which is interesting (though the part about Kevin Spacey was a reach). I was struck by the part about how many Michiganders have been to space. As a U of M alum myself, I thought it was amusing that they missed one: Karl Henize. Well, maybe not really amusing, but more chagrinning since Karl was a professional astronomer, and not too many of those have been to space. When I was at Michigan, Karl came and gave a talk to the astronomy department. This was in late 1985 or so, so I don't remember much of his talk except that he was funny, warm, and engaging (and also that he was missing a part of one finger and was color blind, which he made a point of because astronauts need not be the perfect physical specimens they once were required to be). 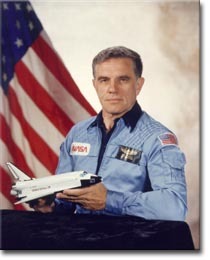 A month or two after he gave the talk, Challenger exploded during launch. I was walking back to my dorm from work, and saw people crowded around a TV at a video store. I asked what was going on, and someone said the Shuttle had "crashed". My knees went weak; I remember that clearly. I watched for as long as I could take it; it was pretty hard to get any schoolwork done for that day... so I wrote a note to Karl, telling him how sorry I was, knowing that he had ridden Challenger just a few months before. He sent me a nice, brief note back. I still have it. Karl died in 1993, of respiratory and heart failure. This may be unremarkable, since he was 67 years old. Maybe that's a bit young, but, after all, he was climbing Mt. Everest at the time. I can hardly walk up a flight of stairs on some days, and I'm relatively in shape. He was an amazing guy. NASA's heading back to the Moon now, and more of my alumni brethren and sistern will be going along for the ride, no doubt. Maybe a friend of mine might be going. I won't go; I like it here. I want to be on the Moon, but I don't want to go there. No way will I strap a rocket onto my backside, but I'm glad others are willing to do it. I'm glad Karl did.